Activist Liliya Osmanova picketed near the "Crimean territorial administration for the affairs of the President of the Russian Federation". 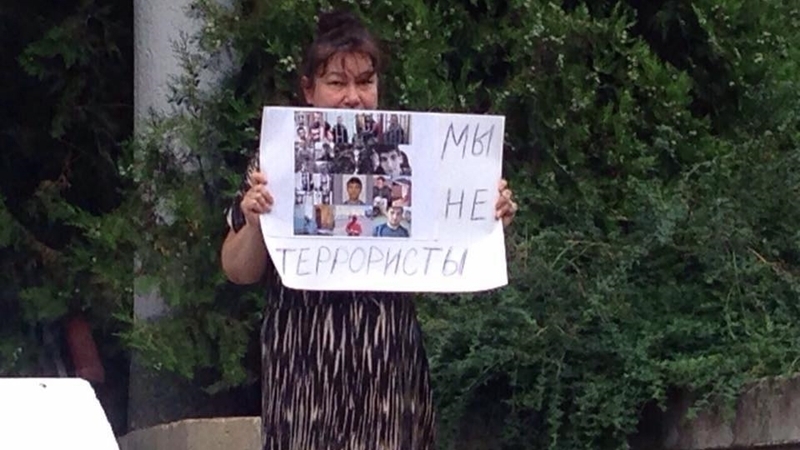 August 21, in the city of Yalta a brave woman Lilia Osmanova came out with a one-person picket with a poster saying "We are not terrorists", Crimean solidarity informed. "One-person pickets are the right of every citizen and an opportunity to declare their human and civic position in a legal way," the activist said. 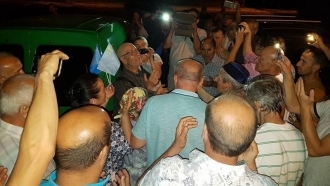 It should be noted that during August 2017, the occupation authorities of the Crimea, in violation of the law, detained Crimean Tatar activists who went to one-person picketss outside the administrative buildings of Simferopol - the State Council, Council of Ministers, the Interior Ministry and the Supreme Court. In particular, a 76-year-old Server Karametov was fined and arrested for 10 days, and a 64-year-old Yarikul Davlatov was fined as well. August 19, Fazil Ibrahimov was detained in the Crimea. He is one of the activists, who demand resolving the issue of allocation of land to Crimean Tatars, who have defended their right to it for more than 10 years. Later Ibrahimov refused to eat in protest.